Pursuing Ph.D in Intellectual Property Rights from Inter University Centre for IPR Studies, CUSAT. LL.M in �Corporate Governance and Securities Laws�from School of Legal Studies, Cochin University of Science and Technology(UGC SAP on CORPORATE Governance and Securities Law). Presented a paper on �The Concept of One person Company under the Companies Act� in the UGC National Seminar on �Evolving Trends in Corporate Regulation� held at School of Legal Studies, CUSAT from 13th to 15th March 2014. 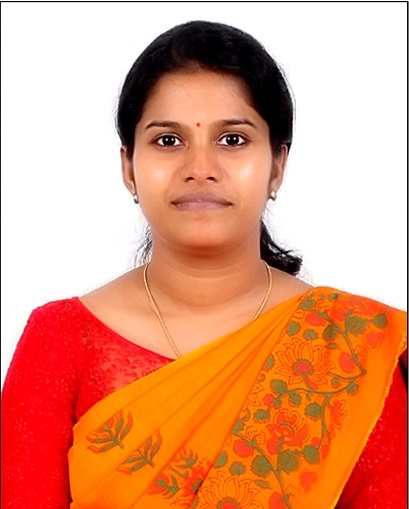 Presented a paper on �Role of Merchant Banker as Security Market Intermediary� in the UGC National Seminar on �Securities Law� held at School of Legal Studies, CUSAT from 14th to 16th February 2013. Presented a paper titled �IP Protection for GM Crops: A Threat to Agro-Biodiversity & Food Security?� in the National Conference on Right to Food: Constitutional Perspectives organized by School of Law, Christ University, Bangalore, JANUARY 6-7, 2017. Presented a paper titled �Towards Sustainable Agriculture: Should the Journey be Backwards?�, in the national seminar on � Transforming the World Towards a Sustainable Tomorrow: Concerns & Challenges� organized by School of Indian Legal Thought, Kottayam, Kerala from 15-17 February 2018. Acted as a resource person and made a presentation on �The Impact of Biotechnological Patents on Food Security� in the two day national workshop on �Biotechnology and Law� organized by School of Legal Studies, CUSAT held on 12th and 13th of January 2018. Acted as a resource person and made a presentation on �TRIPS Flexibilities and Indian Patent Act: The Issue of Access to Seeds � The Law vs. the Practice�in the national workshop for students from law and other disciplines - Rethinking Intellectual Property Rights, 2018 on �IPR, Access to Seeds and Farmers� Rights� organised by the Inter University Centre for Intellectual Property Rights Studies from 18-20 Jan. 2018. Acted as the resource person and led a talk on the topic �Farmers Innovations and IPR� and discussed the issues related to IPR on farmers innovations and ABS mechanisms in a seminar on the subject �Climate Resilient Farmers Innovations� organized as part of an Innovative Farmers Meet in the fourth Wayanad Seed fest, 2018 jointly organized by Community Agrobiodiversity Centre, M S Swaminathan Research Foundation, Wayanad and National Biodiversity Authority from 23rd to 25th of February 2018. Acted as a resource person in �Children�s Rights� in the �Aikyotsavam-2008� camp held by the Kerala State Council for Child Welfare, Thycaud, Thiruvananthapuram from 30th December 2008 to 4th January 2009. Participated in the Global Congress on Intellectual Property and the Public Interest 2015 held at the National Law University, New Delhi from 15th to 17th of December 2015. Participated in the Youth Workshop on Intellectual Property, Public Health and Access to Medicines organized jointly by ISID, People�s Health Movement and Prayas during December 14-22, 2015 at ISID, New Delhi. Participated in ACCESS TO SEEDS: Building Capacities, Discussing Policies, Five-Days Program Co-organized by Institute For Studies In Industrial Development (ISID), Indian Society for Agro Ecology (ISAE) & Third World Network (TWN) from 24-28th October 2016; Venue: ISID, Delhi. Participated in a Refresher Course in IP for Law Teachers organised by the Inter University Centre for Intellectual Property Rights Studies & MHRD Chair on IPR in June 2015. Participated in a Refresher Course in IP for Law Teachers on Developmental Perspectives of IP Law- Series II -Patent Law and Development� organised by the Inter University Centre for Intellectual Property Rights Studies & MHRD Chair on IPR held from June 17-24 2016. Participated in a Refresher Course in IP for Law Teachers on Developmental Perspectives of IP Law - Series III�Copyright: A Social Justice Perspective organised by the Inter University Centre for Intellectual Property Rights Studies & MHRD Chair on IPR in June 2017. Participated inthe national workshop for students from law and other disciplines - Rethinking Intellectual Property Rights, 2017 on �Copyright Issues and Entertainment Industry� jointly organised by the Inter University Centre for Intellectual Property Rights Studies and Chair on IPR in February 2017. Participated and successfully completed with A grade a Fifteen days Interdisciplinary Refresher Course and Training Programme on �Indian Legal and Policy Framework on Biodiversity, Human Environment and Sustainable Development� jointly organized by School of Legal Studies CUSAT and National Biodiversity Authority, Chennai from 16th-30th of May 2018. Participated and successfully completed �Professional Development Workshop� on Intellectual Property Law and Public Interest Advocacy jointly organized by IBA-CLE Chair, National Law School of India University, Bengaluru, M. K. Nambyar Academy for Continuing Legal Education, Kochi and Inter University Centre for Intellectual Property Rights Studies, CUSAT, Kochi. Participated in the Project Initiation Workshop on �Indigenous Traditional Knowledge in Fisheries� organised by ICAR � Central Institute of Fisheries Technology, Cochin in collaboration with Vijnana Bharati, New Delhi under the ESSO-INCOIS, Hyderabad funded project Indigenous Traditional Knowledge (ITKs) in Marine Fisheries Sector of Kerala: Documentation and Analysis on 30th October, 2015. Participated in UGC National Workshop on Corporate Governance & Disclosure Practicesorganised as part of �UGC SAP on Corporate Governance and Securities Laws�held at School of Legal Studies, CUSAT from 18-19 March 2016. Participated in the two day Workshop on Empirical Legal Research held at School of Legal Studies, CUSAT from 26th to 27th February, 2016. Participated in the one day Workshop on Patent Claims Construction jointly organised by the Inter University Centre for Intellectual Property Rights Studies & MHRD Chair on IPR on 14.11.2015. Participated in the National Conference on Visually Impaired and Copyright Regime jointly organised by the Inter University Centre for Intellectual Property Rights Studies & School of Legal Studies in association with MHRD Chair on IPR on 5th March 2016. Participated in the Third Annual Workshop for Law Students on Rethinking Intellectual Property Rights 2013 � �Patents and Access to Medicine for All� held at CUSAT from 10th to 12th of January 2013. Participated inthe national workshop for students from law and other disciplines - Rethinking Intellectual Property Rights, 2018 on �IPR, Access to Seeds and Farmers� Rights� organised by the Inter University Centre for Intellectual Property Rights Studies from 18-20 Jan. 2018. Participated in the two day State level Seminar on Police Reforms and proposed Kerala Police Act, 2008 held at Government Law College Thiruvananthapuram on 25th and 26th November 2009. Participated in the Workshop on Environmental Advocacyorganised by C. P. Ramaswamy Aiyar Foundation, Chennai held at Government Law College Thiruvananthapuram on 18th July 2009. Acted as the student co-ordinator of the national workshop for students from law and other disciplines - Rethinking Intellectual Property Rights, 2018 on �IPR, Access to Seeds and Farmers� Rights�organised by the Inter University Centre for Intellectual Property Rights Studies from 18-20 Jan. 2018. Assisted in organising a one day workshop on Patent Claims Construction jointly organised by the Inter University Centre for Intellectual Property Rights Studies & MHRD Chair on IPR on 14.11.2015. Assisted in organising a Refresher Course in IP for Law Teachers organised by the Inter University Centre for Intellectual Property Rights Studies & MHRD Chair on IPR in June 2015. Assisted in organising a Refresher Course in IP for Law Teachers organised by the Inter University Centre for Intellectual Property Rights Studies on IPR held in June 2017. Assisted in organising the National Conference on Visually Impaired and Copyright Regime jointly organised by the Inter University Centre for Intellectual Property Rights Studies & School of Legal Studies in association with MHRD Chair on IPR on 5th March 2016. Assisted in organising the national workshop for students from law - Rethinking Intellectual Property Rights, 2017 on �Copyright Issues and Entertainment Industry� jointly organised by the Inter University Centre for Intellectual Property Rights Studies and Chair on IPR in February 2017. Worked as part of a Project on �Patent Policies of the Agricultural Research Institutions in the Asian Region: Innovation Practices in Government Agricultural Research Institutions in Asian Region� at the Visionary IP Professors Roundtable held at East China University of Political Science and Law, Shanghai, China.